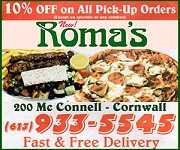 Cornwall Ontario – Mother’s Day is Sunday, May 13th. Happy Mother’s Day to all you Moms out there. For those of us who no longer have Mothers or Grandmothers, it brings back some wonderful memories. I like to say that my Mom was the best…and she was. Six kids at home when I was growing up to feed and clothe and get off to school in good weather and in bad. I don’t remember her ever complaining although I do remember her telling us kids to ‘stop chewing the rag’ when we were bickering. And I don’t remember her being sick. If she didn’t feel up to par, we didn’t know it. She just kept on doing what she had to do: taking care of all of us. 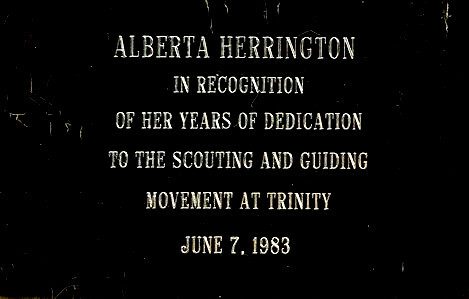 When my sister Evelyn and I were in Girl Guides at the Trinity Anglican Church Company, Mom was a Lieutenant. When we went to camp, she was the cook. Our younger brother Brian, just a wee lad at the time, came also and I remember him being a big help carrying kindling for the campfires, etc. All the Guides said that he was “the nicest little boy”. She was a volunteer as well at Trinity Church in the Funeral Choir, the Nearly New Shop and other volunteer activities in the church. She always appreciated the flowers on Mother’s Day but I know what really touched her was the rose I gave her on my birthday every year. I wish I could go and see her and hear her say once more,” Hi Honey”. I will close my eyes and think of it and I will hear her voice again in my heart. Wonderful memory. Wonderful Mom. We were lucky as kids to have three movie theatres in Cornwall when we were growing up: The Capital on Second Street, The Palace on Pitt Street and The Roxy on Montreal Road in the east end of the City. The movies at the time were musicals with actors like Gene Kelly and Fred Astaire dancing, Jane Powell and Howard Keel singing and comics like The Three Stooges, Bowery Boys and Abbott and Lou Costello. The movies would start with a news bit which we pretty much ignored waiting for the short comic movies like Bugs bunny, Daffy Duck, Donald Duck, Mickey Mouse, and my favourite, Mr. McGoo. We all loved him. At one time it cost 12 cents for a ticket, so if you were a bit short, maybe you could find a few coke bottles to trade in at the local corner store or sell some old newspapers to Mr. Miller. If you really were in the money, then you had some for popcorn and a drink. Some kids brought their own big bottle of Kick Kola or Orange Crush. I remember a friend telling me that he always had 25 cents to go to the show. 25 cents!! Unheard of for a lot of us. However, he was “an only child” in his family. After the movie was over, you could stay and see the movie again if you wanted to. No one told us to leave or pay another 12 cents. Who could forget “High Noon” with Gary Cooper or “Shane” with Alan Ladd?? And of course all our favourite westerns with the Lone Ranger and Tonto, Andy Devine, Gabby Hayes, Hopalong Cassidy. The Cisco Kid and the singing cowboys like Gene Autry and Roy Rogers. Remeber Dale Evans and Roy Rogers singing: “Happy Trails to You”?? 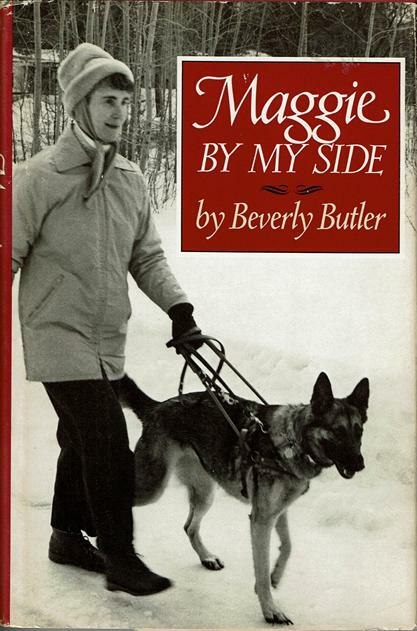 “Maggie By My Side” is a wonderful book written in 1987 by Beverly Butler about her new Guide Dog Maggie, her 5th. In the book she tells what it is like to have to get a new Guide Dog and learn to trust it. Beverly Butler, born in Milwaukee, Wisconsin in 1934, wanted to be an artist. But losing her sight at age 14 changed her life’s direction into becoming a well known author and teacher of creative writing. She wrote 18 books according to her web site. Her books, “Light a Single Candle” which won the Clara Ingram Judson Award and “Gift of Gold” are based on her own experiences. She also received the Johnson Foundation Prize of the Council of Wisconsin Writers. She was married to author Theodore V. Olsen. I bought this book at a book sale some years ago. My husband was blind and had a Guide Dog and it was nice to read it to him. It is inspiring and humorous and a beautiful story of her challenges and joys of training with Maggie. There are pictures and accounts also of all her previous devoted Guide Dogs. For more information and a list of all her 18 books go to: www.goodreads.com/author/show/12923.Beverly_Butler. 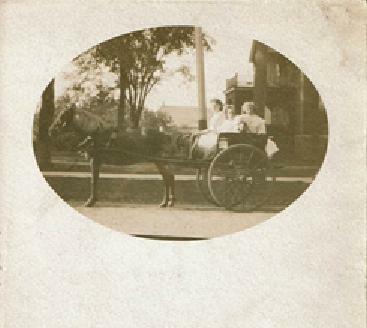 This post card is of the horse and buggy days. On the back it says on the left hand side:” For Inland Postage only – this Space may be used for Communications. On the right hand side it states: The Address Only to Be Written Here. On the upper right hand corner it says: Place One Cent Stamp here. Beautiful horse drawn cart with three ladies going for a ride in it. Probably 1920’s post card. It was in a very old family photo album. Child Haven International is publishing a fund raising children’s book, “Bonnie Ma and Fred Pa’s Big Family”about Child Haven. It is written by Shelley Adam and Melissa Baker Nguyen. Child Haven was founded in 1985 by Bonnie and Fred Cappuccino and Dr. Nat Shah to help orphaned and destitute children in need of food, clothing, and health care, and education, moral and emotional support. There are ten projects in four countries: Tibet in China, Nepal, India and Bangladesh. Recently, Bonnie and Fred Cappuccino received the Dr. Garth Taylor Humanitarian Award and Dr.Nat Shah was the 2013 Humanitarian Award recipient and was also the Cornwall Citizen of the Year. Please email Shelley Adam at shelley@wanderfull.ca for more information or to pre-order a copy of this upcoming children’s book. Also go to www.childhaven.ca for information on Child Haven International. 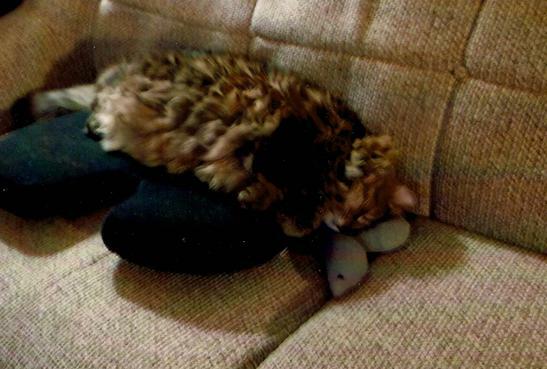 Here is a cute photo of my Big Baby Cat Tiger all snuggled up on a cushion on the couch with his head on his two cat nip mice. This cute and cuddly cat likes his comfort. The 6 year old asks, “You know what? I think it is time we started learning to cuss like Tommy next door”. The mother is furious and orders him to go to his room. He gets up and runs, crying his eyes out with his mother in hot pursuit. Editor’s Note! 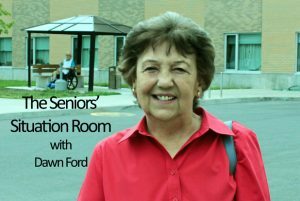 We’re in the progress of putting together a Best of Collection of Dawn Ford’s first 100 Columns!! To be a sponsor of the book please call 855 444 1133 and stay tuned for our pre offer order! Dawn those were great memories of Cornwall and I am a Boomer and remember them well. 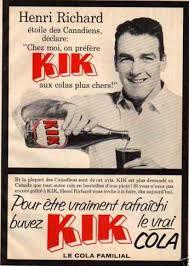 Yes Kick Cola and the three movie theatres and the way our parents were who worked around the home and never complained. I am sitting here crying my eyes out since hubby almost past on with Sepsis (that is the condition that he had that started with a cold and pneumonia) and the neighbors are asking about him. Dawn Wednesday morning we go to the Ottawa General Hospital to have hubbies tube removed from his right lung. The nurse was here today to change his dressing. Hubby cannot wait for that tube to come out and he is making progress. We need good health care and good nurses like yourself. I sure miss the good old days and yes those movies and all. We grew up in better times with better parents. Jules: All the very best for your husband tomorrow and for you also. Thanks so much for your nice comments on the column. I think those old days were the best of times growing up. Dawn you bring out the better days of Cornwall and everywhere and I remember those days very well and wish that I could go back to that good time. The simpler things in life were the very best. My husband is recovering slowly but surely and it is pneumo sepsis that is what I understand from my daughter. He would have died that day if we did not react quickly. Dawn and Jamie hubby went to the hospital this morning with us and had the tube removed from his lung. Hubby was so grateful that he literally kissed the doctors hand like a man would kiss a woman and the doctor is a man – French Canadian. We all have to have a good laugh in this crazy insane world of ours. Jules: Wonderful news about your husband. . Must be a big relief for you and your family. Dawn and Jamie you couldn’t believe the relief that hubby has now with the tube removed and he was so afraid that he didn’t sleep the entire night before going to the hospital and it was for nothing. We are looking around for a medical doctor and same problems as Cornwall. We had an appointment with a doctor in a walk in clinic and backed out after the reviews. It was really bad.